Road trip season is nearly upon us and we’re here to give you some tips on how to handle some sun-drenched driving. Summer’s high temperatures, flurries of dust and dirt and the occasional rain shower can take it’s toll on your vehicle’s most important systems. 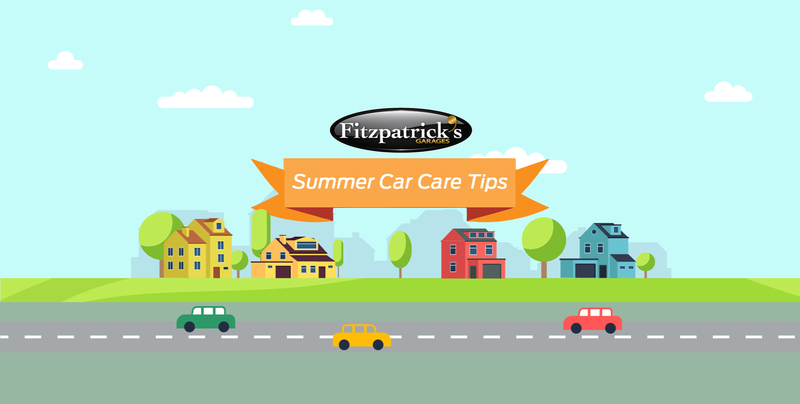 With these essential care tips you can better prepare your car to ensure it runs smoothly and safety through the upcoming summer months. Getting your oil and filter changed is particularly important especially if your last oil change was a while ago. Intense weather conditions of any kind (cold, hot or wet) can put extra strain on your oil and oil filter. Your oil works to keep your engine parts lubricated while the filter works to capture harmful debris, dirt, and metal fragments that have made their way into the oil system. A clean filter means more material gets picked up and that makes more cleaner oil. Cleaner oil means a healthy engine. Seasonal weather changes can lead to low transmission fluid, power steering fluid, coolant and even windshield wiper fluid, so check them all! In particular coolant fluid is one to keep an eye on before the hotter months to prevent your engine from overheating. Stop by our dealership on Dublin Road in Kildare and one of our technicians can take a look for you. Between hitting potholes and dealing with difficult road conditions, your tyres deserve a good check-up. Despite tyres loosing and gaining pressure on a daily basis depending on temperature, tyres if too low tend to wear out much more quickly. Make sure your tyres, including your spare, are properly inflated before hitting the road for a big summer road trip. If your car pulls to one side or your steering wheel vibrates, or the wheel isn’t centred when you’re driving this means you need to get your vehicle’s alignment checked. Alignment can be thrown off by general wear and tear, as well as driving on rough roads, potholes and curbs. Proper alignment can extend the life of your tyres, make for a much smoother ride, and even increase your fuel consumption. Our team here at Fitzpatrick’s Honda Centre can check your alignment, contact us today on 045 533 300. Not many people are aware that heat is the number one cause of battery failure and a reduced battery life. If you’re unsure or worried about how much life is in your battery pop into our dealership and we’ll have our technicians take a look. One of the most important safety features on your vehicle are the brakes. In stop-go-stop traffic, long holiday road trips and harsh conditions may have done a reduced the stopping power of your brakes. Whether your brakes are making unusual noises or demanding extra pressure it might be time to drop your car into us to be checked. There’s nothing better than a summer evening drive when the sun is low and large in the pinky-blue sky. But this can be hazardous, especially when your car’s windshield is dirty. Even from the inside, the haze can diffuse the light from the sun and make things hard to see. Things look much sharper after your car has had a good wash, plus keeping your exterior clean protects the paintwork from the sun’s rays, as well as any damage caused by birds or insects. We can’t promise a long hot summer but ensuring your car is summer ready will mean when the temperatures do begin to rise you’ll be ready for whatever summer adventures bring. Contact us today on 045 533 300 if you have any questions or wish to book your car in for a service or health-check.